When we’ve tried paleo diets in the past, it’s been hard to come up with easy, portable and filling breakfast ideas. For us, scrambled eggs become a quick and easy fallback- but on mornings when my husband’s running out the door on the way to work, it is hard to hand him a plate of eggs and think it’s not going all over his suit. He’s TERRIBLE about eating breakfast, so I really have to make them easy, quick, and ready to eat and filling- or he’ll just skip. 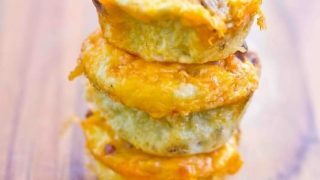 That’s why I LOVE these Paleo Egg and Chorizo Muffins – because I can bake up a big batch, freeze them, and have them ready for single servings on crazy mornings! Let me first say I am NOT someone who is a fan of frozen eggs. I don’t know what it is- I’m already a little egg skittish- but these muffins freeze really well and don’t totally dry out, thanks to the way we’re baking them, and the delicious extra fat the chorizo provides. If you’re on a low carb/paleo diet, fat is something you want to be sure you have plenty of to keep yourself satiated and energized- so don’t skip the chorizo. If chorizo is too spicy for your tastebuds (it’s important to buy fresh, non-processed chorizo to avoid soy and gluten- and fresh chorizos tend to be spicier in my experience) you can also use some all natural sausage. Just be sure to check for gluten or soy if you are trying to avoid both… they can be found in preservatives and fillers in some produced sausages. When these are cooked, you can wrap them in individual foil packages. You can either microwave or bake them in the morning, and eat with a fruit salad. If you’re not concerned with carbs, pop them on english muffins or hawaiian sweet rolls, and you have a breakfast sandwich that is totally out of this world!!! In a large pan, brown chorizo until cooked thoroughly. While chorizo is cooking, generously grease muffin pan with cononut oil. Optional- add onions, asparagus, broccoli, bell peppers or other veggie and brown with chorizo. Add browned chorizo into muffin pans. In a large bowl, whisk eggs and water until fluffy and slightly foamy. 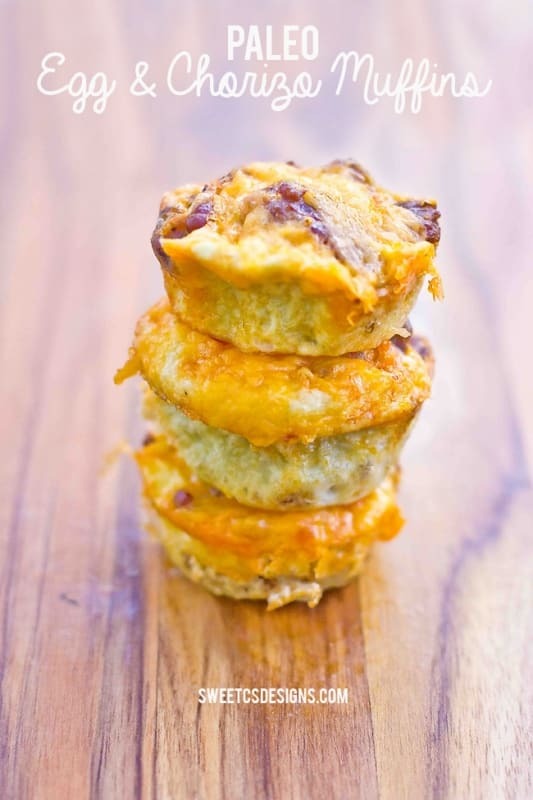 Pour eggs into muffin tins. Bake at 350 for 15 minutes or until completely cooked through (a toothpick inserted in the middle of the muffin will come out without runny egg). Optional- halfway through add shredded cheddar cheese. Previous Post: « Get Kids Excited to Garden and Grow Something Greater! These are great for keto diets. I use the big muffin tins and this makes exactly 6 large muffins. Great for meal prepping for week. These look incredible. How long will they last in the refrigerator? I’ve made these twice so far, even my husband who isn’t a huge chorizo fan really like them. Also so you’re aware, when I made them last time, I tried to pull it up on Pinterest but I kept getting a message that it was blocked due to potential spam. Could I use Goat Cheese in lieu of Cheddar? yes! Any cheese that melts works.